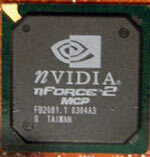 The success of nVIDIA's nForce2 chipset has been nothing short of phenomenal. In only half a year, nVIDIA have dethroned the previous champion chipsets from VIA and have created quite a reputation for themselves in the stable high performance chipset arena. Today we're going to be checking out Abit's NF7-M nForce2 IGP (Integrated Graphics Processor) AMD AthlonXP motherboard. Other then the on board GeForce4 MX videocard care of the nForce IGP northbridge this board is virtually identical to Abit's extremely successful NF7/NF7-S motherboards with the exception that is lacks both built in SATA and IEEE1394 support. Knowing how well those other two iterations of the NF7 platform have performed, I'm sure you'll agree we have some high expectations about what this board will be able to do, so let's get started! The list of integrated "goodies" is concise; we have the standard 3Com-based 10/100 LAN, a set of USB2.0 jacks, and 6-channel audio integrated into the motherboard; LR front, LR rear, Center/Subwoofer, and optical connect. 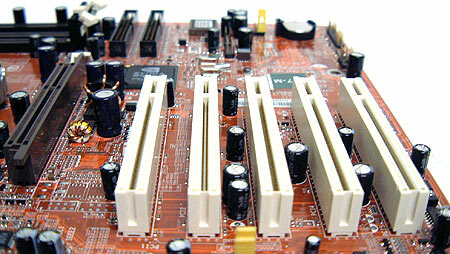 With five 32-bit PCI slots you won't have any problems adding in future expansion cards if desired either. 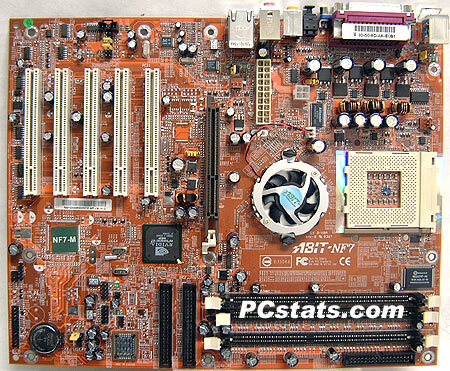 The motherboard supports any current 200/266/333 MHz FSB based AthlonXP processor, and will take up to 3GB of PC1600/2100/2700 DDR RAM or 2GB or PC3200 DDR RAM running under a dual channel configuration. The NF7-M uses a rather strange looking orange/brown coloured PCB, but then again looks are only skin deep. The general layout of the NF7-M is good, I would have preferred to have the main ATX and auxiliary power connectors elsewhere, but I understand that being close to the MOSFETs provides the cleanest voltage signals to the motherboard powersupply circuit. The motherboard is very well labelled, if you do not happen to know what a header does just look closely on the PCB and you'll find a description. Something I was extremely happy to see was that the NF7-M was only using Rubycon capacitors, nothing else. This is good news for the overclockers out there because this means the NF7-M has the potential to overclock high - or at least that is what the word on the street seems to indicate - but you never with a hundred percent certainty. I always like seeing a manufacturer use components which have a good reputation for quality on their products. It indicates they care about the level of quality of their product and considering the recent failure rates surrounding some low ESR capacitors, this is an important area for the longevity of the board. 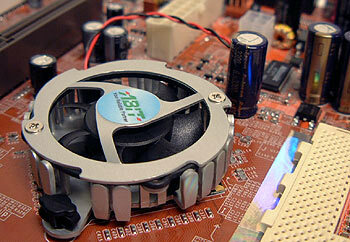 While most motherboards using the nForce2 chipset only have passive cooling on the Northbridge, Abit have equipped the NF7-M with a small active heatsink. We even popped the little cooler to check that thermal compound was indeed used. If you decide to upgrade out of vanity, or necessity, to a larger active Northbridge heatsink you'll appreciate the fact that ABit have placed the fan header just a few millimeters up on the board. An extra fan header is also located just above the AGP slot, a good thing if you intend to add extra cooling to a temperamental videocard. My biggest complaint about the NF7-M is the location of the IDE connectors, which are located just below the DIMM slots. In that position there is the potentially they will interfere with longer videocards like the GeForce4 Ti4600 or GeForceFX 5800 Ultra. It's well known that the MCP/MCP-T Southbridge gets very hot and quite a few manufacturers have already put passive heatsinks on it, Abit should follow suit here as well, but don't. Pg 3. Soft Menu III, don't ya love it?